We noticed that in CF patients with diabetes the initiation of insulin treatment was associated with a notable clinical improvement that could not be explained by the treatment of their relatively mild hyperglycaemia. In addition glucose values on home or ward monitoring were often higher than those seen during the OGTT. We therefore gave insulin treatment to four patients with long standing CF, who had weight loss and deteriorating lung function without a clear cause, and had high random glucose values even when their OGTT showed normal glucose tolerance. We report improvement in all four patients in objective markers of clinical status. Case 1 was a 20 year old male, homozygous for DF508, diagnosed at 6 years of age with failure to thrive and a positive sweat test, with pancreatic insufficiency and stable cirrhosis. From the age of 19 years his lung function and weight had been deteriorating despite trials of corticosteroids, DNase, intravenous and nebulised antibiotics, and nutritional supplements. An HbA1c (4.6%) and OGTT (75 g glucose, baseline 3.8 mmol/l, 60 min 10 mmol/l, 120 min 4.6 mmol/l) were normal. He was given a glucometer to monitor his random post-prandial blood glucose (RBG) concentrations, revealing 11 (out of 30) values above 11.1 mmol/l (6.0–24.0 mmol/l) during a two week period. He was commenced on a trial of Insulatard. Three months later on a dose of 8 units daily, without symptoms or glucose values suggestive of hypoglycaemia, his weight (43.7 kg to 49.4 kg) and spirometry (1.48/3.69 l to 1.78/3.85 l; see fig 1) had increased. 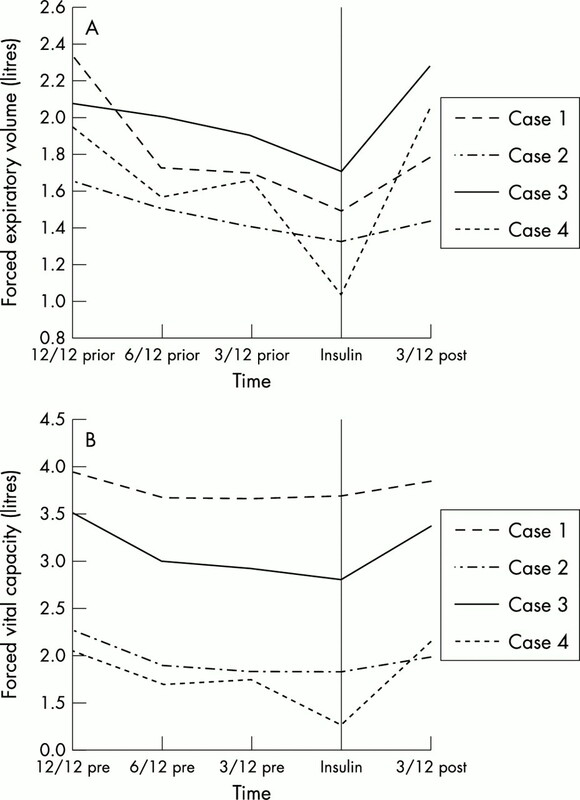 Improvements in FEV1 (A) and FVC (B) after the introduction of insulin therapy. Case 2 was a 23 year old female with pancreatic insufficiency, no history of liver disease, and a genotype homozygous for DF508, who first grew Pseudomonas aeruginosa in her sputum aged 20 years. From the age of 21 she had problems with weight loss and declining lung function without clear cause. At 22 years of age, because of an RBG of 12.0 mmol/l she underwent an OGTT, which was normal (baseline 4.9 mmol/l, 120 min 6.7 mmol/l), as was her HbA1c (5.3%). She continued to lose weight and was commenced on a trial of Insulatard. Three months later on 6 units daily, without symptoms or glucose values suggestive of hypoglycaemia, her weight (50 kg to 54.2 kg) and spirometry (1.32/1.83 to 1.43/2.00 l; see fig 1) had increased. Case 3 was a 23 year old female diagnosed at birth with a positive sweat test and genotype DF508/Q220X. She is pancreatic insufficient with hepatosplenomegaly and has consistently grown Burkholderia cepacia in her sputum. Since the age of 22 she had declining weight and lung function. During an infective exacerbation at the age of 22, while also on oral prednisolone, a 60 minute glucose value, after a glucose challenge (50 g), was 12.0 mmol/l. One month later, while no longer on prednisolone, an HbA1c (4.4%) and OGTT (75 g, baseline 4.2 mmol/l, 60 min 4.5 mmol/l, 120 min 6.1 mmol/l) were normal. Glucose monitoring at this time showed that some post-meal values exceeded 11.1 mmol/l. Subsequently she was commenced on a trial of Insulatard. Three months later on 8 units once a day, without symptoms or glucose values suggestive of hypoglycaemia, her weight (46.0 kg to 47.8 kg) and spirometry (1.7/2.8 to 2.00/3.14 l; see fig 1) had increased. No other therapy had been instituted during this period of time. Case 4 was a 15 year old female diagnosed at birth with failure to thrive and a positive sweat test, with pancreatic insufficiency and no known liver disease. She had been stable until the age of 14 when her weight and lung function started to deteriorate. At the age of 12, because of an RBG of 11.6 mmol/l, she underwent an OGTT (baseline 3.9 mmol/l, 120 min 7.5 mmol/l) and HbA1c (4.9%), which were normal. This was repeated again at 14 years (4.5%, baseline 4.5 mmol/l, 60 min 11.0 mmol/l, 120 min 6.8 mmol/l). She was provided with a glucometer to monitor her glucose concentrations, revealing a number of raised blood sugars (up to 18 mmol/l) and so was commenced on a trial of insulin. Three months later on Novorapid insulin 5 units once a day and Mixtard 30/70 7 units prior to her gastrostomy feed, without symptoms or glucose values suggestive of hypoglycaemia, her weight (29.3 kg to 30 kg) and spirometry (1.02/1.27 to 2.05/2.16 l; see fig 1) had increased. We report four patients with CF who had deteriorating respiratory function and weight loss that improved with the introduction of small doses of insulin despite having normal glucose tolerance on an OGTT performed within 9 (range 1–9) months of starting insulin. In all cases RBG values exceeded 11.1 mmol/l, suggesting that there was evidence of hyperglycaemia despite the OGTT result. These preliminary results suggest that the appropriate timing of initiation of insulin therapy may need to be earlier than occurs in clinical practice at present. This small series of consecutive cases does suggest that insulin can result in a significant clinical improvement, even without significant hyperglycaemia as shown by OGTT or HbA1c, although interestingly all cases had multiple RBGs above 11.1 mmol/l. If these results were repeated in a large patient series it would support the early introduction of home glucose monitoring in patients at risk of diabetes, with insulin treatment being introduced on the basis of these results rather than WHO criteria during an OGTT. The improvement with insulin treatment in weight and lung function seen in our patients has also been seen by Lanng and colleagues in patients with CFRD, as assessed by OGTT, treated with insulin.4 There is, however, also clinical deterioration in weight and lung function 2–4 years prior to the diagnosis of diabetes on OGTT.3,4 Analysis of patients in this prediabetic phase has revealed declining insulin secretion and that the degree of insulin deficiency appears to be correlated with the rate of decline in clinical status.3 These results support the concept that it is the insulin deficient state that leads to the clinical decline and not solely the abnormal glucose metabolism. Insulin is an anabolic hormone with roles in both lipid and protein metabolism, and its absence could potentially have a significant impact on the overall nutritional and clinical status of the patient. The benefit in our patients is unlikely to result from improved glucose concentrations as HbA1c values were normal before insulin treatment and not altered significantly by it. The development of diabetes is associated with a poorer clinical prognosis with a sixfold increase in morbidity and mortality in patients with CFRD.6 The nature of this deterioration remains somewhat unclear, with debate surrounding whether CFRD leads to the deterioration or whether it reflects an association with the more severely affected, and hence sicker patients. It may be that early insulin therapy is one of the most effective treatments in patients with long standing and complicated CF. We feel that while interpretation from such a small case series is limited, there is sufficient evidence to study this further in a large randomised control study. We propose that in patients with CF clinically significant insulin deficiency may precede the development of diabetes as defined by OGTT. Finkelstein SM, Wielinski CL, Elliott GR, et al. Diabetes mellitus associated with cystic fibrosis. J Pediatr1988;112:373–7. Lanng S, Thorsteinsson B, Nerup J, et al. Influence of the development of diabetes mellitus on clinical status in patients with cystic fibrosis. Eur J Pediatr1992;151:684–7. Milla CE, Warwick WJ, Moran A. Trends in pulmonary function in patients with cystic fibrosis correlate with the degree of glucose intolerance at baseline. Am J Respir Crit Care Med2000;162:891–5. Lanng S, Thorsteinsson B, Nerup J, et al. Diabetes mellitus in cystic fibrosis: effect of insulin therapy on lung function and infections. Acta Paediatr1994;83:849–53. Nousia-Arvanitakis S, Galli-Tsinopoulou A, Karamouzis M. Insulin improves clinical status of patients with cystic fibrosis related diabetes mellitus. Acta Pediatr2001;90:515–19. Moran A, Hardin D, Rodman D, et al. Diagnosis, screening and management of cystic fibrosis related diabetes mellitus. A consensus conference report. Diabetes Res Clin Pract1999;45:61–73.